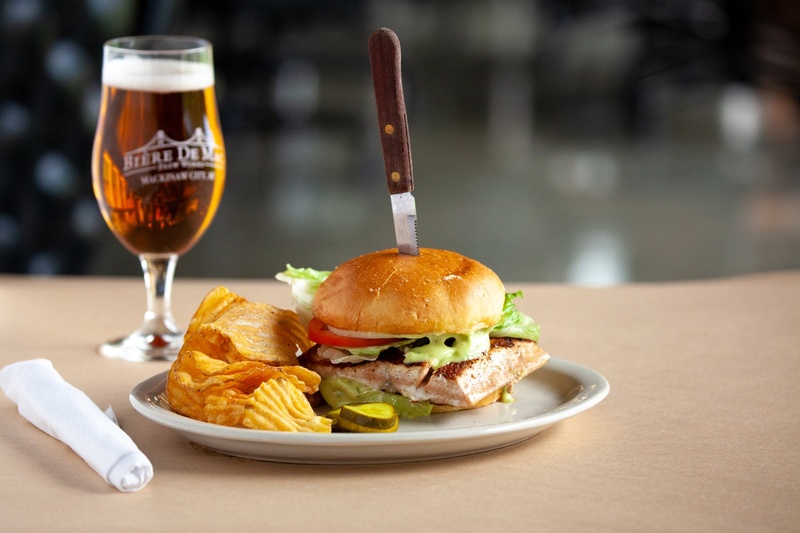 Burn a few calories on the snowshoes then get dosed fresh from the firkin with craft beers and creative eats at these Northern Michigan brewpubs. 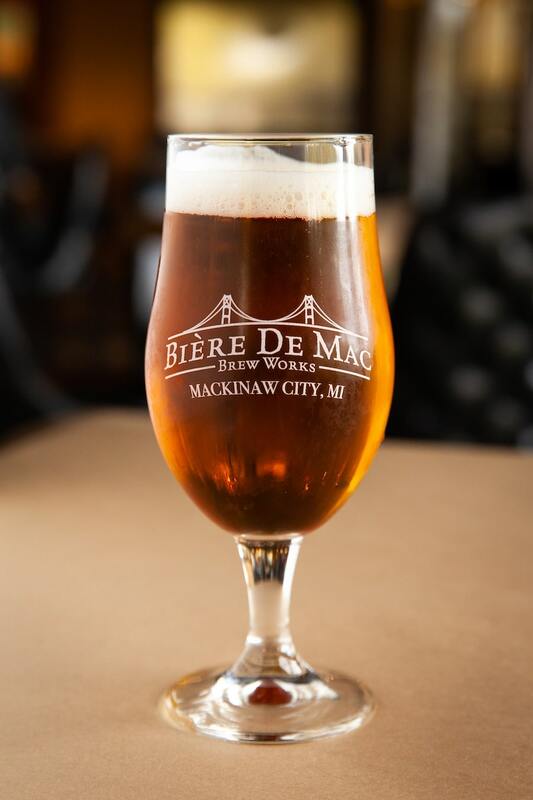 Hunkered under a copse of old birch trees, Bière de Mac stands as a fortress of freshly brewed farmhouse ale just before the bridge. Polished wood paneling and black vinyl armchairs channel the ghost of a retro supper club that occupied the building for four decades before father/son duo George and Danny Ranville opened their brewpub in January of 2017. The menu, driven by Chef Edgar Jacobs, tracks brew- friendly couture anchored by sharing plates like flash-fried cauliflower glazed with honey, lime and sriracha, seriously legit housemade baba ganoush and nachos mounded with roasted pork shoulder and charred green chiles. For beer enthusiasts in need of heartier fare to offset the Imperial ABV’s, Bière de Mac unapologetically delivers sweet potato poutine with cilantro and gouda curds, crispy whitefish goujons and formidable burgers like the Au Cheval dressed with green chiles, pepper jack and a fried egg. Read on this month as we indulge our early winter metabolism in the North’s best beer halls. 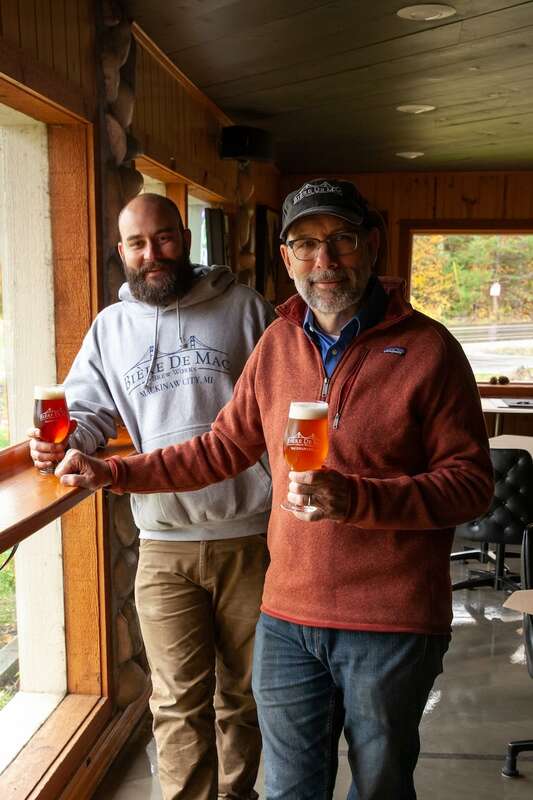 Centuries-deep roots in the Straits of Mackinac and a dose of entrepreneurial bravado inspired George Ranville and his son, Danny, to launch the Tip of the Mitt’s northernmost craft brewery in the winter of 2017. With two years of the beer business under his belt we sat down with George to talk inspiration, brew food innovation and the best way to gain five pounds in one meal. Biere de Mac was an aprés-run idea? Yep. Five-and-a-half years ago my wife and I were marathon training on the island. When we finished in Marquette Park we met up with Danny and I told him ‘Wouldn’t it be great if we could get a cold local craft beer right now.’ He agreed. Here we are. What’s it like being the last brewery before the bridge? Because of the huge seasonal swing in this town we have a small cast of regulars compared to most breweries so we have to reach out to travelers. That means providing great beer and interesting food that gives people a reason to pull off the freeway on their way to Lansing or Menominee. You guys have definitely stepped out of the burger and pretzel box. Tell us what drives the menu. We’re catering to foodies. Beer is very versatile with food and you can come here and pair a pint of our Dive Bar Situation Double IPA with soba noodles in dashi broth. I can dig double IPA and dashi but since we’re talking dark beers this month what’s a clutch pairing for the cold? I’d order up a flight of our Bateau Brown, 49 Fathoms, Dark Sky Dunkel and Winnie the Bulldog Imperial stout paired with our Mighty Mac & Cheese that has bacon lardons, Plath’s Polish sausage and butternut squash. That’ll warm you up. Traverse food and drinks editor Tim Tebeau writes from Petoskey. dining@traversemagazine.com. Dave Weidner is a freelance photographer based in Traverse City. dweidnerphoto@gmail.com.